A gyfyd Lloegr a’i gafael. Throughout the Middle Ages the ability to fight and to lead others into battle was considered an important quality amongst the nobility and gentry, and this is very much reflected in Welsh praise poetry. 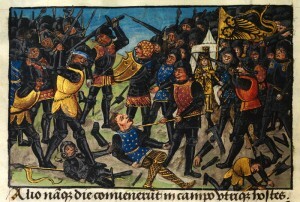 Less privileged soldiers received little attention from the poets, by comparison, even though they played such a large and important role in medieval armies. From the fourteenth century onwards paid military service became increasingly common, with soldiers being given a specific sum of money for a specific period of service. Guto’r Glyn himself was one of the Welshmen who chose to enlist in the English army during the final phase of the Hundred Years’ War, taking part in an expedition to France in 1441 (and perhaps also an earlier one in 1436; see Guto’r Glyn). There is no evidence that Guto fought in the later Wars of the Roses (the struggle for the crown of England that ended with the battle of Bosworth in 1485), but the effects of this conflict were felt strongly in Wales and supporters of both sides, the Lancastrians and the Yorkists, were amongst the poets’ patrons. It was a warlike, dangerous time, and various kinds of weapons and armour were used not only by soldiers but also by ordinary people to defend themselves. Important developments in military technology occurred from the fourteenth century onwards, including the development of increasingly effective plate armour and the introduction of the gun. These developments are reflected in the poets’ works, and they were also aware of specific centres of production of arms or armour such as Milan in Italy. Guto’r Glyn also refers to Wrexham, in north-east Wales, as a centre for making bucklers (a kind of round shield). Guto describes the buckler in a poem of thanks. Poems of this genre, along with poems of request, are very important for the study of weapons and other material objects because of the detailed descriptions they provide of the objects given, or sought, as gifts. Guto’s works also include a poem to request a brigandine (brigawn), a type of armour, and another for a kind of helmet called a sallet (saeled). Most of his other references to weapons or armour are very brief in comparison, often serving to convey praise of a patron in terms of military prowess, courage or other virtues such as generosity. Even so, his poems provide a valuable glimpse of the medieval battlefield, seen through the eyes of a poet who was acquainted with several important military leaders and had been a soldier himself in his youth. : B.O. Huws, Y Canu Gofyn a Diolch (Caerdydd, 1998). : For a more detailed discussion, see J. Day, ‘ “Arms of Stone upon my Grave”: Weapons in the Poetry of Guto’r Glyn’, in B.J. Lewis, A. Parry Owen and D.F. Evans (eds), ‘Gwalch Cywyddau Gwŷr’: Essays on Guto’r Glyn and Fifteenth-Century Wales (Aberystwyth, 2013).